Ori’s happiest childhood memories were of exploring ancient ruins with her parents on forgotten alien worlds. Her ship, the More Gravitas, is the only home she’s ever known and the only surviving connection to those better days. Together with her Bentu pilot, Sya, they take any job they can get— legal or otherwise— to keep the old, run-down thing flying. All the while, Ori nurses a dream to somehow recapture those happy times. Petals-Fall-Into-Midnight is an Archivist— a historian serving a holy mandate to preserve the past. But even for a species of carrion-eating pariahs like the Vulch, she’s something of an outsider. She’ll have to pursue her self-appointed crusade without her people and seek the help of aliens— both concepts foreign to a species so dependent on the company and support of their tight-knit communities. Each has what the other needs, even if it isn’t exactly what they’d been hoping for. 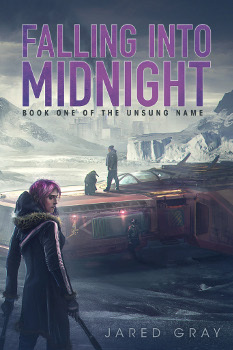 When the crew’s first expedition leads them to a backwater ice mine that’s hiding an ancient, deadly secret, Ori may get more use out of her old skills than her new ones. The workers in the mining town are acting strangely, the local Vulch community is nowhere to be found, and the manager of the mine seems to be in a terrible hurry to get rid of the crew. Perhaps someone should have asked why the planet’s native civilization disappeared in the first place. Digital Editions – Available on Kindle, Nook, Kobo, iTunes and most other online stores. Paperback Editions – Available from Changing Hands Bookstore, Amazon, and B&N. Signed Paperbacks – Order Here!